This is a study for a larger drawing of the entire bird. I wanted to get a feel for working on the colored, textured gray paper, and also to get the correct feather directions. The main feather tracts of a bird's upper body start at the beak, so it's important to get them correct! 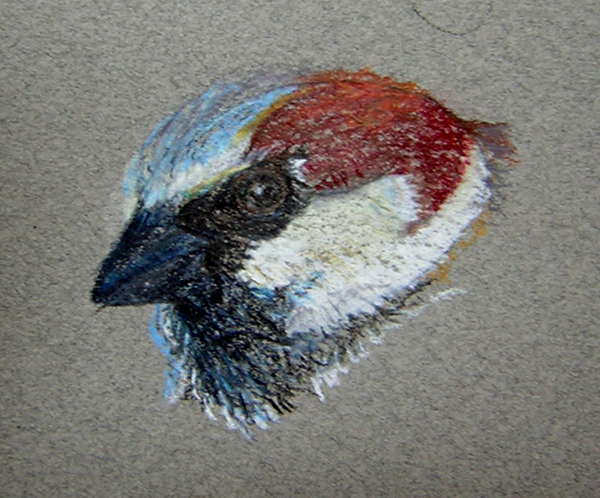 This entry was posted in Birds, Drawings, Sparrows and tagged bird, birds, colored pencil, drawings, house sparrow, Passer domesticus, pencil, Prismacolor, sparrow. Bookmark the permalink. aloha Abigail – you have a very good eye. i like the way you build up your color. in this one i also like the texture you get and that i can see the line as line, yet i also feel the form and shapes of the bird and feathers. cool.